As all fans of the Everything’s Rosie CBeebies series will know, Rosie and Raggles are best friends, so it’s no wonder that Vivid Imaginations have chosen these two characters to create the gorgeous Sweet Dreams Rosie & Raggles Dolls set. Soft, cuddly and reassuring, Raggles even has a glow in the dark zip on the front of his suit! With special sensors built inside the Rosie doll, all children have to do is hug her close to them and hear her talk lots of her favourite phrases. When it's time to snuggle down to sleep, children can squeeze Rosie's tummy and hear her sing a lullaby and watch her cheeks glow. How clever is that!? 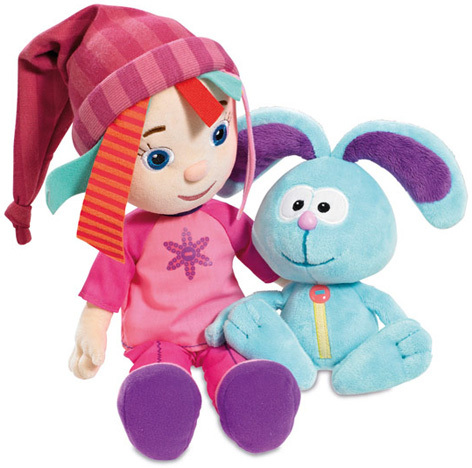 Rosie and Raggles are inseparable in the show, and young children will immediately identify this interactive set as one for their wish lists. Please tell us what you think of Sweet Dreams Dolls by Everything's Rosie.